Well known among musicians as the industry leaders in guitar synths, BOSS and Roland have produced as unbroken chain of innovative products starting with the GR-500 in 1977, the world’s first guitar synthesizer system. While the capabilities of each generation have grown with the power of evolving technology, all of these products have one thing in common: they require a special “divided” pickup to access synth voices. 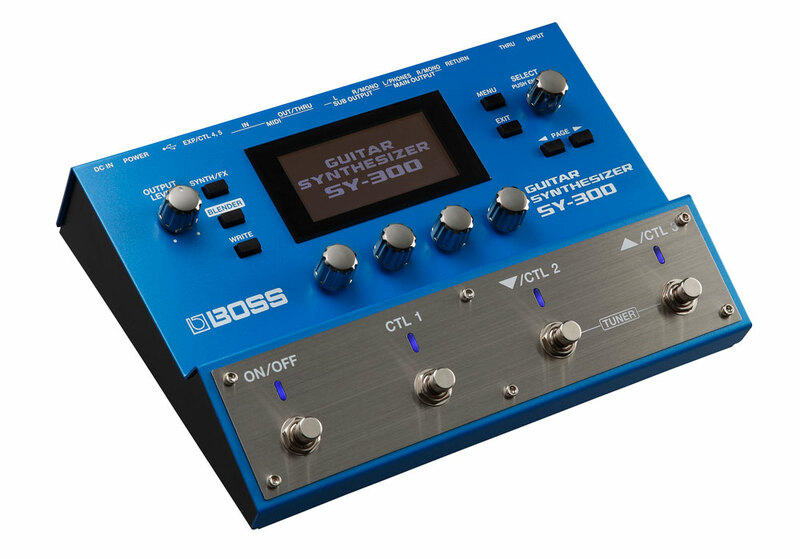 Now, with the SY-300, BOSS has achieved what was impossible with previous technologies—a fully polyphonic, fully playable analog-style guitar synth that can be used with any guitar or bass, with no special pickup needed. Just grab your instrument, plug in with a regular 1/4-inch cord, and play! The BOSS SY-300 Guitar Synthesizer can be used with the regular 1/4-inch output of any electric guitar or bass. You can read all about the amazing capabilities of the SY-300 in this previous post, and also at the SY-300 product page. But it’s important to note that, in contrast with the GR-55 and other Roland guitar synths over the last 25 years or so, the high-tech SY-300 takes a more old-school approach to its synth sound shaping. Using blazing-fast DSP, it focuses strictly on modifying your tone in real time with subtractive synthesis methods, using traditional analog-style synth tools like oscillators, filters, amps, and LFOs. Further to the point, if you’re looking to play “real-world” sounds like piano and acoustic drums, the SY-300 doesn’t do that. At the extreme, the sounds you get out of the SY reach into the realms of classic analog keyboard synths. But you can also use its powerful sound tools to enhance your normal tone in a variety of cool ways, enabling you to shape an endless range of expressive, all-new textures that retain a distinctive guitar voice and feel. The GR-55 is the flagship guitar synth and modeling processor from Roland, and it’s been out for a few years now. While it requires the GK divided pickup that I mentioned earlier, your extra efforts are rewarded with sound possibilities that can’t be achieved with any other single guitar processor, including the SY-300. 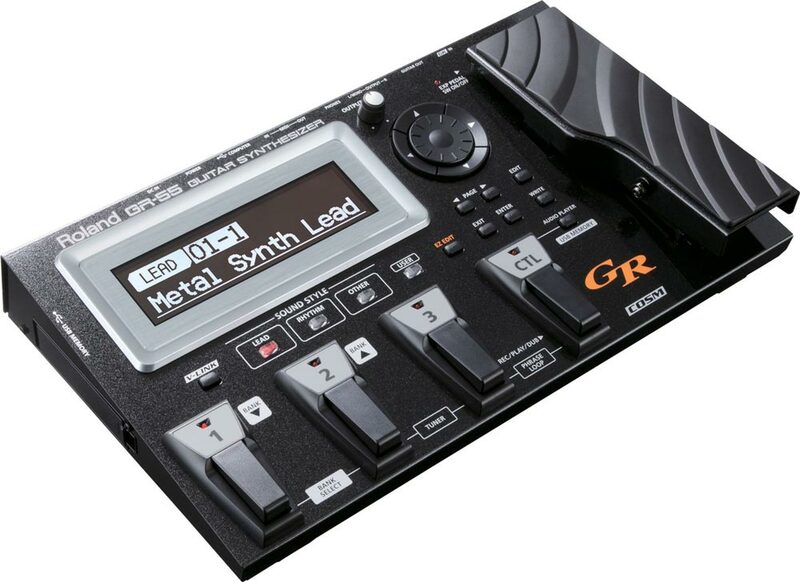 The Roland GR-55 Guitar Synthesizer combines COSM instrument and amp modeling with sample-based PCM synthesis. What makes the GR-55 so unique and powerful is that it’s the only Roland guitar processor to combine COSM-based V-Guitar modeling technology with a PCM synthesis engine. This gives you the best of everything in one: instrument and amp modeling, instant alternate tunings, multi-effects, and sample-based synthesis (that’s right—piano, drums, and much more). With the GR-55’s instrument modeling, you can change the sound and tuning of your guitar or bass at will. A variety of electric and acoustic stringed instruments are available, plus synth-type modeled sounds like the GR-300, Wave Synth, Filter Bass, Crystal, and others. There’s also a huge selection of COSM amps and cabs for dialing in your tone, plus lots of great effects. The PCM side of the GR-55 contains two sample-based synth engines, each loaded with sounds from Roland’s legendary keyboard synth library. The synth engines can be layered together and combined with the straight and modeled tones any way you like. PCM gives you access to the “real” instrument sounds I talked about before—acoustic and electric pianos, organs, strings, brass, drums, sound effects, and many more. You can learn more at the GR-55 product page. There’s also a previous post that dives into the GR-55 in even more detail. Which Guitar Synth is Right for You? The SY-300 and GR-55 can both deliver a wide range of analog-style synth tones as well, but the under-the-hood methods used to achieve them are different. With the SY-300, BOSS engineers have developed all-new tech to create organic, highly responsive synth tones in real time from a regular guitar input. The GR-55’s COSM synth sounds (which require a GK pickup) are similar in that they use real-time processing, which also provides responsive playability. On its PCM side, the GR-55 has analog-style synth voices as well as acoustic instruments. However, these are internal samples that are triggered with your playing, much in the way a keyboard player triggers samples with a controller keyboard. Though this triggering process in ultra-fast, playing PCM sounds can sometimes feel less “guitar-like” than playing the SY-300’s sounds or the GR-55’s COSM instrument and synth sounds. The latter sounds connect more seamlessly with your natural playing techniques, thanks to the real-time processing methods used to create the sounds you hear. So, which synth do you choose? It’s really about how you want to use the synth with your guitar. In my mind, the SY-300 excels at naturally extending the sound of your normal guitar into new tonal areas, both subtle and extreme. On the other hand, the GR-55 gives you the tools to transform your guitar into something completely different, and nearly anything you want it to be. Of course, these are just general observations; the SY-300 can certainly create sounds that are unrecognizable as a guitar, and the GR-55 is more than capable of enriching your normal tone in very subtle ways. If you’re currently using a typical guitar/amp rig with stompbox effects, the plug-and-play SY-300 is really a great choice. It’s compact, designed to interface easily with your existing setup, and includes lots of great BOSS effects (which can be used independently from the synth voices) to add to what you already use. Most of all, the SY-300’s natural playability allows you to bring all types of fresh new tones to your music with the ease of adding a new pedal to your board. On the flip side, if you’re attracted to multi-effects processors, unlimited sounds, and maximum versatility, the GR-55 might just be the dream machine that does everything you need. While it also requires a GK pickup (or GK-ready guitar), this extra gear opens a world of capabilities for live and studio use that are simply not available with any other single device. The bottom line is you can’t go wrong with either one—it just depends on your needs and how you like to work. In fact, after you play them and experience the incredible sounds they have to offer, you might just end up with both! While we’re discussing guitar synths, I should also mention the BOSS GP-10 Guitar Processor. It focuses on instrument and amp modeling and multi-effects only (no PCM synthesis), providing similar capabilities to the modeling and and effects sides of the GR-55. It offers a variety of COSM synth sounds as well, including an OSC (oscillator) synth that’s not in the GR-55. 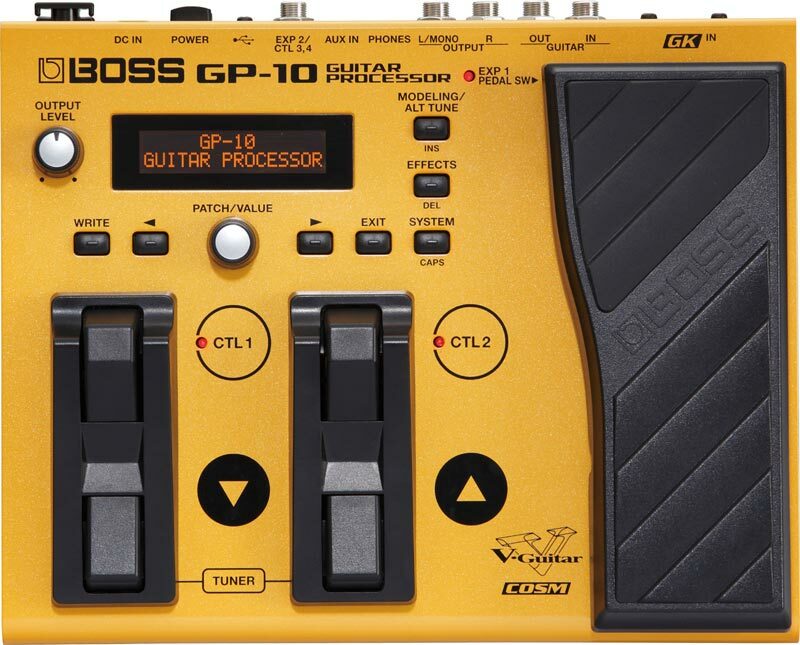 The BOSS GP-10 Guitar Processor features both a 13-pin GK input and a regular guitar input. Like the GR-55, a GK pickup is required to access modeled instruments, altered tunings, and synth voices. However, the GP-10 also has a normal 1/4-inch input that allows you to use the amp modeling and effects with your regular guitar. With its compact size, high-quality sound, and big versatility, the GP-10 excels as a grab-and-go effects unit for everyday gigging, both with and without a GK pickup.